Adventures | Dream. Depart. Explore. Since I love to travel so much I talk about it A LOT. This leads to learning other people’s philosophies on travel; why they go, where they go, when they go and why they don’t go. I come from a traveling family and happen to have married someone who likes to travel as much as I do (OK so it was a requirement for me). For a long time I had my blinders on, I assumed that everyone liked to travel just to differing degrees when it is simply not true. Sometimes those who don’t care to travel are married to those who do. What do you do if you are bitten by the travel bug but your spouse is not? Options abound for travel when your spouse or significant other doesn’t like to travel or if you don’t currently have, or want, a spouse or significant other. 1. Vacation with family or friends who live in the same town as you do. This makes planning easy and you can share a car or ride to the airport. 2. If you don’t have people who live in town who like to travel, then travel to see people who do and then continue your adventure together. Bonus: you’ll get to spend significant time with people you don’t get to see often. 3. Join a travel group or club – many cities have groups of like minded people who meet and travel together. These groups offer everything from day trips to those lasting a month or more. 4. Go on a group tour – there are scores of companies that offer wonderful tours domestically and all over the world. Head out with one of these groups and you’ll come back with friends from all over the country, maybe the world. 5. Travel by yourself – there is nothing like the flexibility that comes with having to answer to no one but yourself. If you want to get up at 5 a.m. and see the sun come up, no one whines. If you want to sleep in until 11 a.m., no one will bounce on the bed because they are bored. It is much easier to pop into a hotel or hostel and find room for 1 as opposed to 2 or more. It’s like this folks, on road trips my husband loves to drive and hates to be a passenger. I, on the other hand, prefer not to drive and rather enjoy being a passenger. A match made in heaven I tell you. In our more than 18 years together and 70,000+ miles of road trips I have driven for exactly 3 hours. Yes, a scant 200 miles or so. Wanna know why I drove those? For 2 hours my husband was still recovering from food poisoning and if it weren’t for the lake-effect snow we were trying to stay ahead of, we would have camped out at the hotel for another day. The other hour was because he was so tired he couldn’t keep his eyes open. Kansas is kind of boring to drive through folks, even if the reward at the end is Colorado. I swear I-70 is basically just 450 miles of grain. Many thanks for feeding the country though, we genuinely appreciate your hard work! Therefore I am the best darn road trip passenger you have ever seen. It works out for us. I essentially wait on him hand and foot which he loves because I never do so at home, unless he is just this side of hospital sick. In return he drives me all over the place to visit friends and family and go on adventures. I don’t like traffic, particularly in cities. 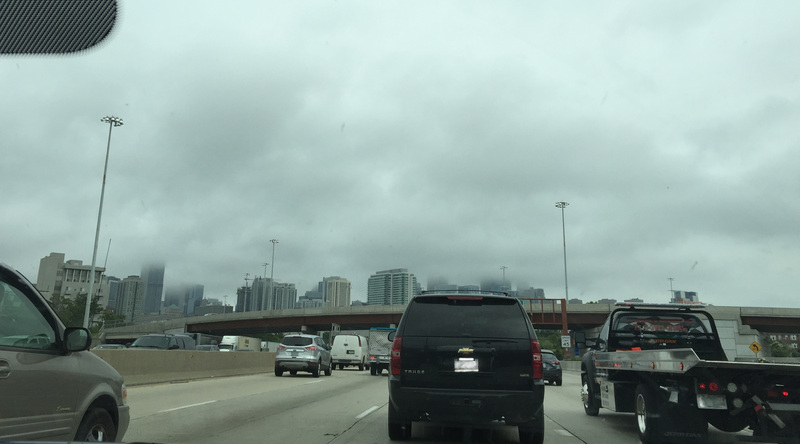 However, places like Chicago are between me and my vacation sometimes. Thanks for driving hubby! 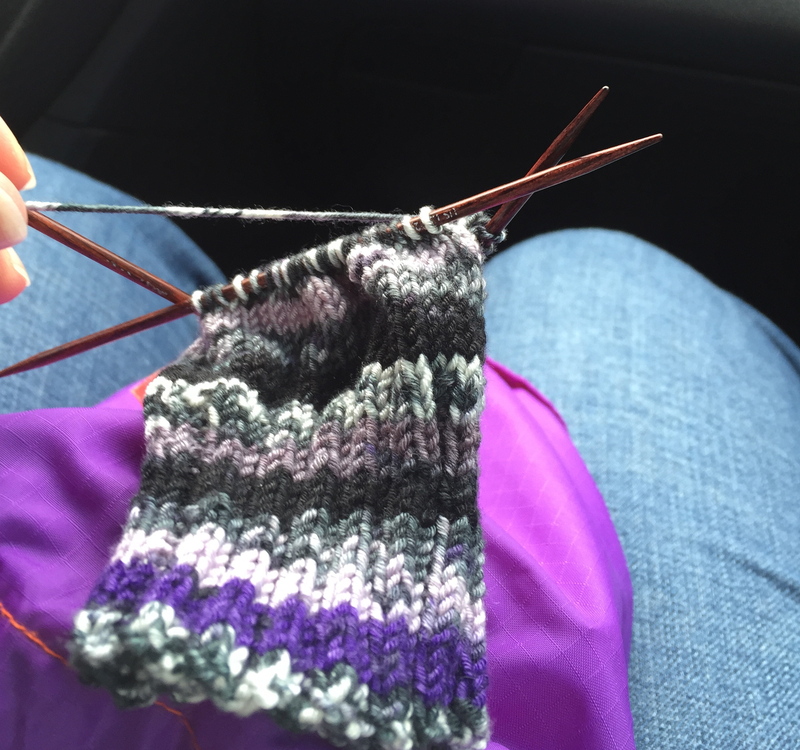 Sock knitting in Chicago traffic. Sanity for all of us! Mainly we talk, a lot. We plan for the trip, for life after the trip and we catch up on all of the funny little things that have happened over the last few months that our over-scheduled lives have kept us from mentioning to each other. My goal is to keep him well-fed, entertained and awake. Such people are better and safer drivers. That’s good for me, him, our daughter and anyone who happens to be on the road with us. As you know, I have a very scientific way of choosing vacation spots. 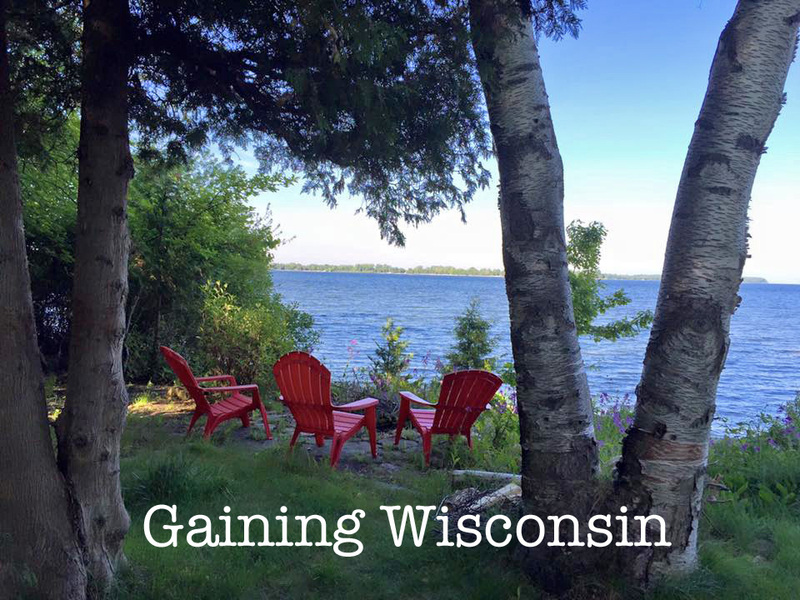 😉 Even so, we happened upon a perfect spot for our family to unwind and enjoy time together, Door County, WI. It took a little longer to get there than we planned as we hit some VERY strong storms on our way up but we made it in one piece. Our cottage was just south of the town of Sturgeon Bay and was on Green Bay itself. The views were gorgeous. We happened to visit the first week of June when the weather was perfect by my standards – sunny and mild. Also, everything was open but there were very few other vacationers as most schools in the state were still in session. At Peninsula State Park, the only time in my life I’ve ever taken a picture timed this well. I caught the boat! View from the top of the Patatowami State Park Observation over the water. Great view was worth climbing the open wooden tower! Yup, those are goats on the roof at Al Johnson’s Swedish Restaurant! Sunsets over Green Bay in general – chase them people! Our first sunset in Wisconsin. This is the view from our cottage for the week! As you may have noticed, you haven’t heard much from me lately. The last 6 months were, hands down, the busiest in recent memory. There was barely time to do laundry, never mind keep up with my writing. I’ve missed you though and I’m glad to be back! In my continuing effort to collect states and countries, I am pleased to announce that I have finally been to Wisconsin! Growing up in the northeast, Wisconsin was pretty far away and not easy to drive through on the way back from most states (notice which ones I’m still missing). Living now in the midwest, it is a lot closer. So off we go! Pick a state I haven’t been to yet – the closest one will do. 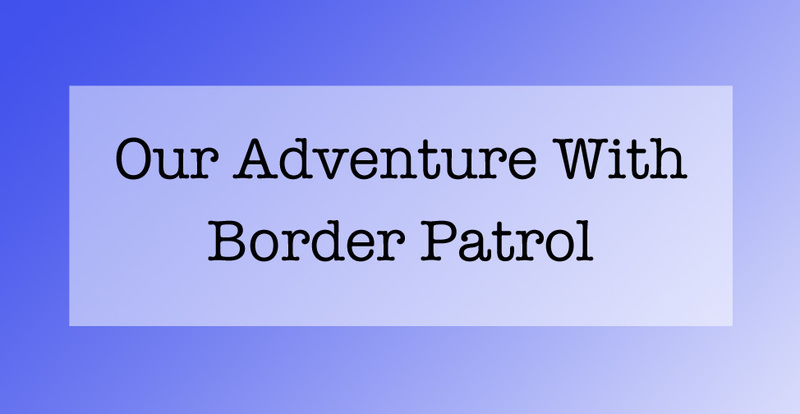 Decide what type of vacation we as a family want to take – in this case a lake vacation. Google my parameters, e.g. “best lake vacation in Wisconsin”. Stumble upon a place that apparently many people I know have been to but I have never heard of. Rent cabin on Airbnb – It was perfect! 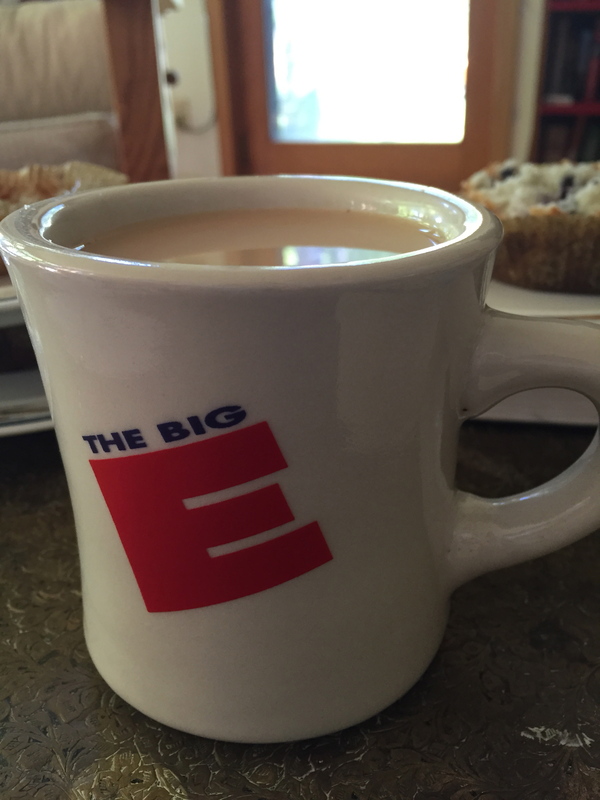 The Big E mug that was in the cabinet. It was a touch of home all the way out in Wisconsin. I claimed as my own for the week. Do a little more internet research on what is available nearby. Lots of parks! Wait anxiously for the week to arrive and hope for good weather. 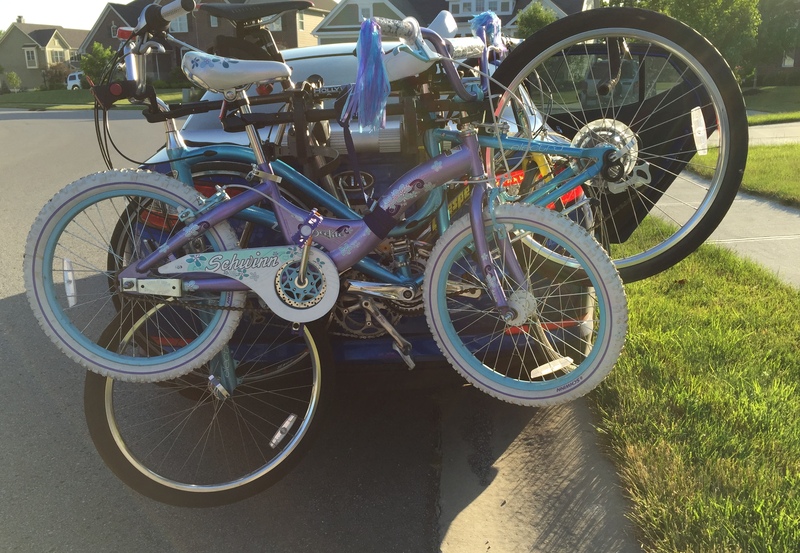 Pack light, strap bikes to the back of the car and go! Traveling with bikes is not for the faint of heart.